How old is my Toyota forklift? Toyota forklift year. Decoding forklift model numbers can be difficult to begin with and it seems as though Toyota only makes it harder. Each year Toyota creates a model number with a different set of letters and numbers that all stand for something. These characters make up the engine type, construction features, any model changes, how it’s powered, the load capacity and more. The different characters in the model number are explained in the coding system below. In the example, there are 8 characters in the model number although the coding system shows 9 possible characters. For any empty spot like the one below, it means there is no information applicable to the forklift so you can simply skip that section. Note: You can find a vast array of Toyota forklift radiators here. 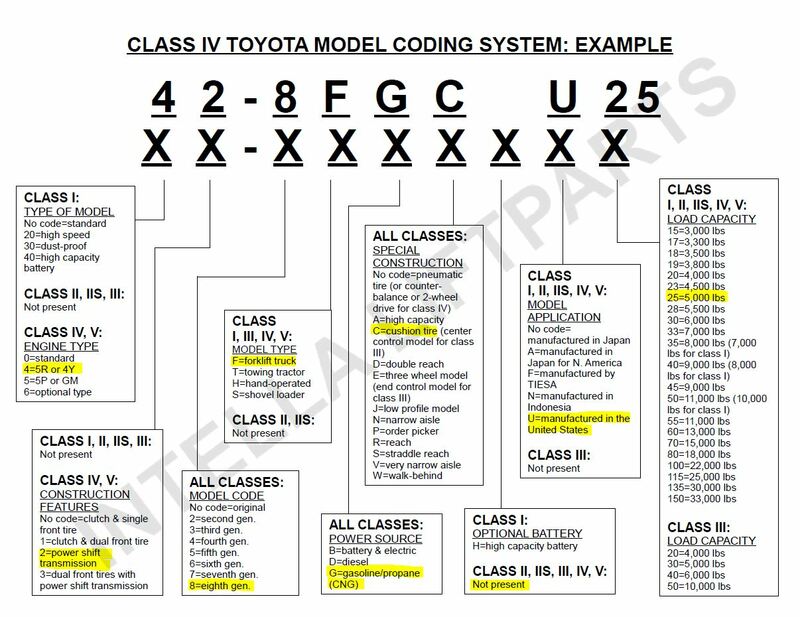 Click here for a full size representation on how Toyota codes their models. So what is the age of my Toyota forklift? shipping and great customer service, Intella Liftparts can help. You can also check out our YouTube channel here for how-to videos, product overviews, and other great clips.